Remember being a kid and going to the grocery store and there were those big bins of loose, wrapped candies? They were 5¢ and on the honor system, so you’d toss your nickel into the tin collection box and then mull over the ten or so different options. Strawberry hard candy wrapped in its metallic strawberry-print wrapper? Yes. Caramel logs flavored with raspberry, vanilla, and maple? My weakness. Root beer barrels? Come on! So nostalgic! Sadly, you don’t see many of these around anymore (I recognize that I totally sound 125 years old right now) and a quick Google search recently led me to a hard and true fact: some of these tiny treats are gone for good. So what’s a girl to do when her boo thang waxes poetic about the sweet coconut flavors of a Brach’s Neapolitan Coconut Sundae and your jaunt down Memory Lane ends in the word “discontinued?” Well, you get resourceful and you turn to Aunt Martha, and she (though I imagine really it’s some underpaid sous chef somewhere) figures out a recipe to recreate these candies of yore. Soon, you’re on your way! Thanks, Internet. 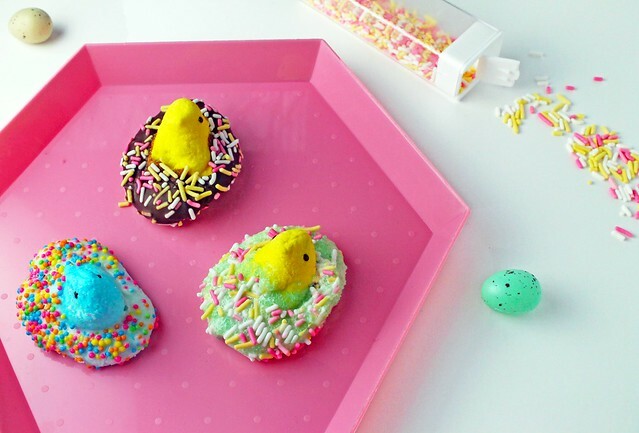 While mine aren’t quite as pretty as hers – I have a heavy hand when it comes to anything pink – I think these are just the cutest little bites and would bring cheer to anyone that met them. They have such a pleasant coconut taste that, while sweet, is not cloying thanks to their combination of unsweetened and sweetened coconut flakes and not all of the latter. They have a slight chew to them and a buttery richness from the white chocolate, which makes up the pink and white layers; milk chocolate composes the majority of the bottom layer. 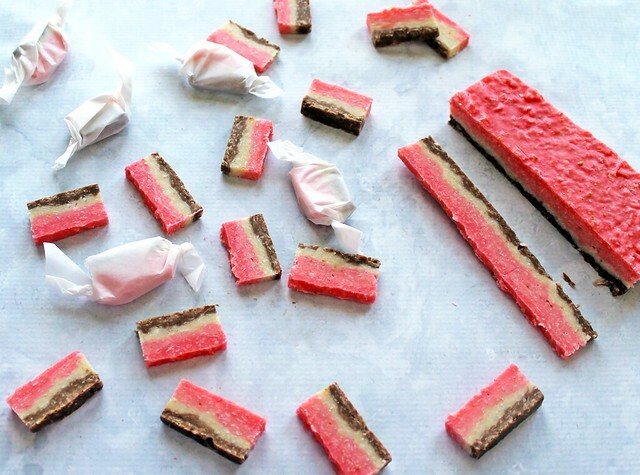 The hardest part of this whole recipe is splitting the candy evenly enough to spread and form three distinct layers and, really, that just requires some measuring and some patience; two things my thick, pink layer could have benefited a little more from. Seriously, though, these are a cinch of a confection and they don’t even require a candy thermometer! 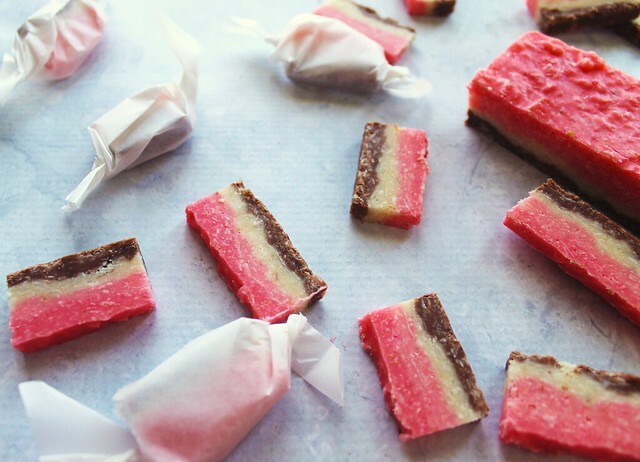 Neapolitan Coconut Sundae Candies are an easy, tasty reproduction of a classic that is undoubtedly missed, but not nearly as badly now that I have the recipe for these in my back pocket. I love when things work out like that! Yields approximately 160 candies; recipe here. 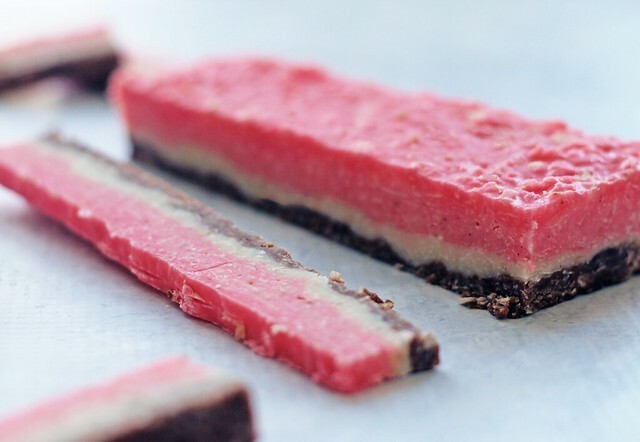 Pink or red gel-paste food coloring, as needed; start with the tiniest bit, it goes a long way! Line an 8-inch square cake pan with plastic wrap, aluminum foil, or parchment paper, leaving a 2-inch overhang on 2 sides. In a medium sized pot, combine the white chocolate, the sweetened condensed milk, butter, salt, and vanilla extract and melt over medium heat. Stir until completely smooth. Remove mixture from heat and incorporate both kinds of coconut. Next, divide the mixture evenly among 3 bowls. Stir milk chocolate into one of the 3 bowls until combined. Add the food coloring gel into another one of the 3 bowls, stir to combine, and set aside. Leave remaining bowl plain. Spread milk chocolate layer into the bottom of the square pan. Next, add the plain coconut layer in large dollops before spreading gently over the milk chocolate coconut layer. Be careful not to blend the middle and bottom layers. Follow this same process for the top pink layer, covering the white layer completely. When finished assembling, place in fridge for 2-4 hours or until firm. If you need to give it more time to firm up, or want to stop there overnight, be sure to cover the top gently with another piece of parchment paper, so that it doesn’t absorb refrigerator smells. When ready to slice, unmold the coconut square using the overhang and discard the plastic wrap, parchment, or foil. Trim all sides about 1/2-inch to create a clean, smooth surface. Cut slices off the block about 1/4″ thick and 1-1/2″ long. 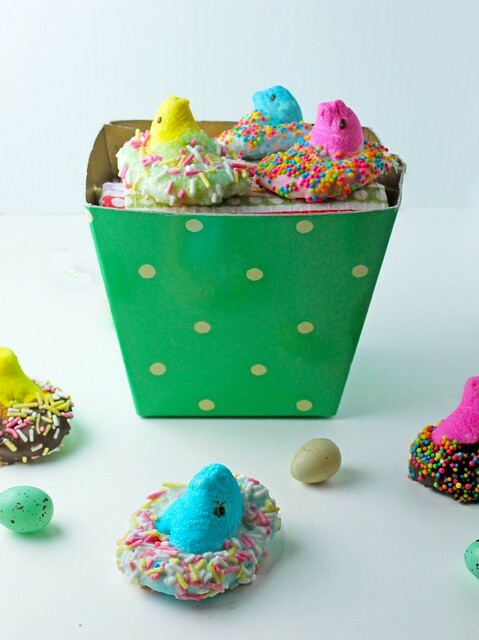 Wrap individual pieces in parchment or store in a candy jar in the refrigerator for up to a week. Do I have to do much more than type out the title of this post and upload a photo? Because I think the words themselves – take them in again, why don’t you? Coconut. Ice. Cream. Graham. Cracker. Crust. Swirl. – and the pictures seem convincing enough. On their own, they beckon, no? I’ve already professed my love for coconut here, but truth be told, I might love graham cracker pie crust even more. The blending of the cracker with sugar and butter satisfies my salty/sweet cravings in a big way. It also doesn’t hurt that it usually serves as the foundation for heavy, decadent fillings, like mousses, custards, and puddings! Here, though, I mixed and baked a graham cracker crust as I normally would for a cheesecake or a key lime pie and, once it was cooled, I swirled it into the ice cream. Yum! Let me tell you about this ice cream, friends. It’s a simple recipe in that it doesn’t require a custard preparation on the stove first – though, truth be told, when making ice cream from scratch, I do find custard-based recipes to have the most familiar consistency. 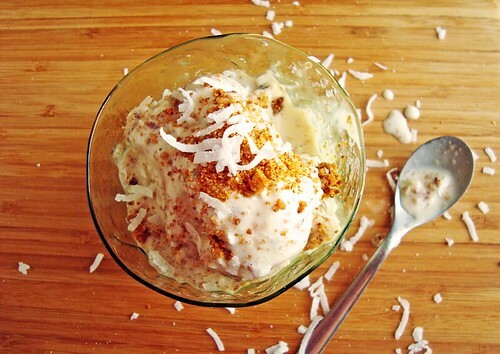 This coconut ice cream gets it’s very creamy texture, however, from a can of sweetened condensed milk which, when blended with half & half and a can of coconut milk, achieves the perfect amount of fresh coconut flavor. This flavor is only enhanced by the addition of sweetened, shredded coconut in it’s straight-from-the-bag form, as well as from the toasted variety. 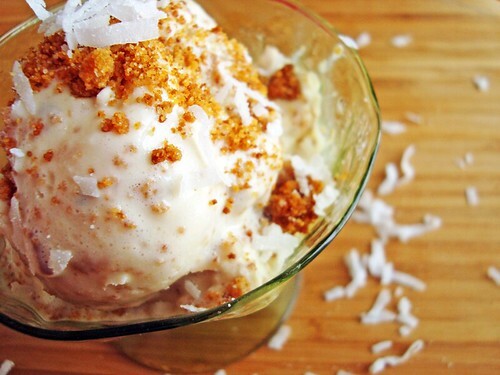 The former adds the extra boost of coconut flavor needed to really distinguish it as a coconut ice cream and the toasted bits provide a deep, caramelized note in addition to another layer of texture. Not to mention the intense aroma it gives the ice cream! Even after sitting in the freezer for days (should you have the restraint to allow such a thing), removing the top of the container offers up the most heady scents of coconut done three ways, accompanied by the layers of crumbled graham cracker crust throughout. Unf. Any more reading here is just time taken away from digging out your ice cream maker and getting to work! This ice cream would be great during a summer barbecue, served on top of a blueberry pie, or made the star of your Mother’s Day table. You could even add a scoop to your morning smoothie if you wanted! Heck, I’m not going to judge you. Note: Before beginning this recipe, read your owner’s manual to your ice cream machine, so that you know how best to plan ahead. 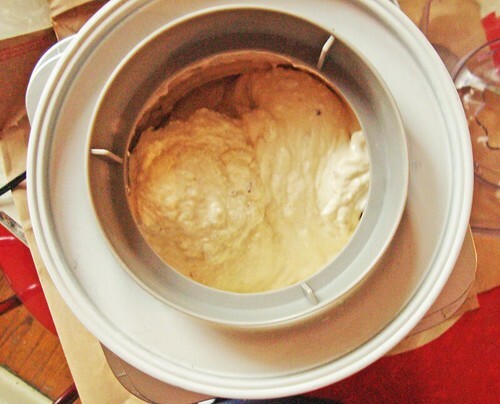 My ice cream machine, for example, requires you to freeze an insert solid – usually 24 hours – before churning. I’ve also learned with use that I get the best results if the mixture I’m planning to pour into the machine is very cold. I like to keep it in my refrigerator overnight before churning. In a small frying pan, over medium heat, sprinkle 1/2 cup of sweetened flake coconut evenly and allow to brown. You will need to keep a close eye on it and should stir it every two minutes or so until it is complete. Allow to cool. With a handmixer, blend the sweetened condensed milk, half & half, coconut milk, salt & vanilla together until smooth in a medium-sized bowl. 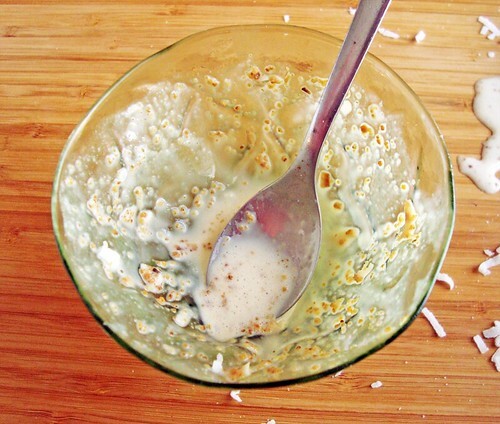 Incorporate the toasted coconut and the remaining 3/4 cups of sweetened coconut flakes. Mix well, cover, and store in the refrigerator until the liquid is very cold. This is where I usually let it sit overnight for maximum coldness. On the day you will finish the ice cream, prepare and bake your graham cracker crust. Preheat the oven to 350°F. In a small bowl, stir together the graham cracker crumbs, sugar, and melted butter until combined. Press into the bottom of a 8-inch by 8-inch pan and bake for 10-15 minutes or until browned. Allow to cool. Remove the ice cream mixture from the refrigerator and give it a good stir before pouring into your machine and making according to the manual’s instructions. While ice cream is churning, break graham cracker crust into bits and pieces. Once ice cream is complete (it may be a very soft consistency, but it should not be liquid), scoop some into the container you will store it in and spread it out. 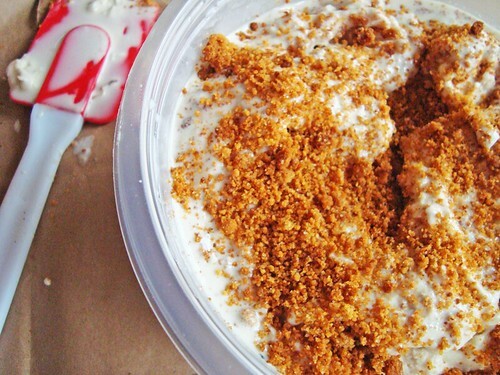 Follow with a layer of graham cracker crust crumbs and then another layer of ice cream. Repeat until neither remains. With the end of a wooden spoon, swirl the layers together. Affix lid and freeze until frozen. 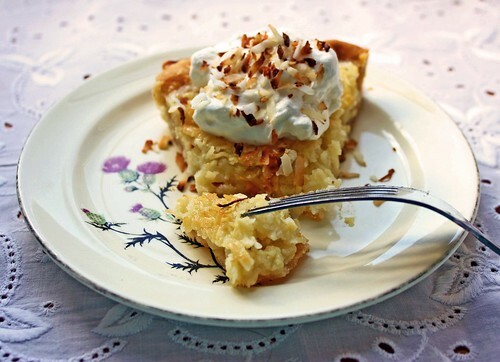 Coconut custard pie is one of those desserts that, for me, always sounded delicious in theory, but still never made it’s way onto my “to make” list. I’ve passed over it for so many other kinds of pies, all while heralding coconut as one of my all time favorite flavors. I remember going to the grocery store with my mother when I was a kid and always begging her to buy a coconut to bring home. On the occasions when she would indulge me, I’d present it to my father as if it were the Hope Diamond, giddy at my conquest. My dad loved coconut, too, and we held a secret delight in sharing the water we’d caught from it in a glass while my mother looked on wincing at the cloudy liquid. I guess the joke is on her now that coconut water is the new greek yogurt among health food nerds and hipsters! What kept me from making coconut custard pie, though, and what I imagine is the road block for even the most accomplished cooks is the simple word, “custard.” It strikes fear in the hearts of so many because of it’s known volatility. Fail to temper the mixtures when combining and you have scrambled eggs. Cook it too far and it’s paste; too little and it’s runny and raw-tasting. When done right, custard owns the show, as far as I’m concerned. The best ice cream, puddings, pies, and pastries, all require it. You can tell just by looking at it’s rich yellow color and it’s pillowy creaminess that it is one of those foods that just taste naturally good in its simplicity. Simplicity of ingredients, that is, not method. But, wait! What is this? 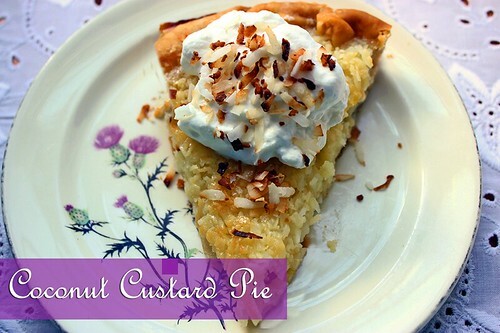 Coconut custard pie that turns to custard in the oven and doesn’t require crossing your fingers over the stove? Mama like! I found this recipe when I was home visiting my family, stuck between the pages of an old cookbook. It was scrawled on an index card in a hand we didn’t recognize, but it look well-loved and like someone had made it a number of times given the stains and the faded print. Making it just felt right. And it didn’t disappoint. This coconut custard pie is more coconut than custard, but still retains that pure densely dairy flavor of the latter. The taste of coconut here is fairly delicate, as you soak sweetened coconut in milk for several hours and then mix into some dry ingredients and eggs. Going the extra steps of whipping some cream and toasting some extra coconut to put on top is worth the effort in that it adds a nuttier, deeper coconut flavor because of the browned shreds, a nice textured crunch, and a freshness from the cream. I also learned a really useful tip from this recipe that I’ve never come across before. The recipe has you “seal” the bottom pie crust, before you pour in the custard, with a foamy egg white brushed over the bottom, sides, and edge of the dough. Allowed to sit for a few minutes this way, the egg white forms a barrier between the pie dough and the custard, allowing it to brown and not become soggy because of the liquid-laden filling. Genius! Goodbye to my nemesis, the pasty-bottomed pie and hello to a welcomed addition to my dessert arsenal! 3-6 hours prior to assembling the pie, add 1 cup of coconut to the milk, stir and allow to soak in the refrigerator for several hours. When ready to prepare the pie, preheat the oven to 375°. Roll pie dough out into a glass pie plate. Crack two eggs into a bowl and one egg yolk, adding the third egg white to it’s own bowl. Whisk the lone egg white until it is foamy and brush the pie dough – bottom, sides, and edge – with the egg white, creating a seal. Allow to set while creating filling. In a separate bowl combine sugar, flour, a pinch of salt, and set aside. Beat the 2 eggs and the extra yolk in their bowl and slowly add the coconut milk mixture with vanilla. Combine thoroughly. Slowly add wet ingredients to the dry and mix well. Fill the pie and bake for 25-30 minutes or until the center is set and the crust is golden brown. Allow to cool and set up. In a small, dry frying pan, add 1/4 cup of shredded, sweetened coconut and toast gently over medium heat until lightly browned. 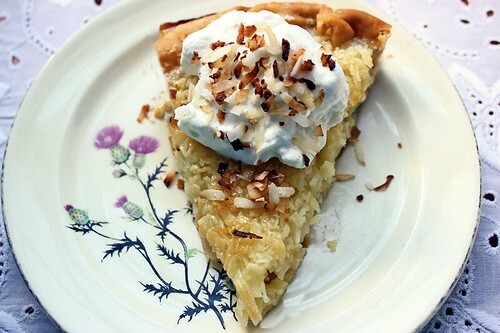 Top pie with whipped cream and toasted coconut and serve. When you go to college with just over 2,000 other women, there’s a lot to laugh about. In fact, I don’t think it’s healthy to make it through 4 years of school at the Bryn Mawr’s and Smith’s of the world if you’re incapable of identifying moments where the whole notion is a little bit hilarious. Don’t get me wrong, my time at Mount Holyoke College in picturesque Western Massachusetts was nothing short of wonderful. It changed me in ways that any college experience should, forced me to read the American canon, and introduced me to lifelong friends. But it was also stuck in a constant tussle between the traditional, bougie image of being the nation’s oldest women’s college and the rampant liberalism and queerness of its student and faculty bodies. Imagine then our nightly tradition of Milk & Cookies, aka M&C’s, where the dining hall of each dorm opened up between the hours of 9-10pm for some kind of sweet treat and the milk, soda, or hot beverage of your choice. The dorks, the divas, the white girls with dreads, the crew and rugby teams (swoon! ), all of us, clamoring downstairs to stuff our little faces. We had it so good. 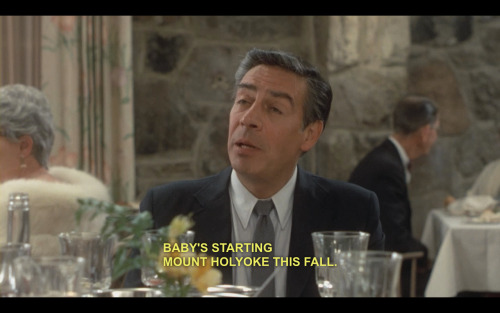 My beau, who was down the road serving time at UMass this very same moment in time, never misses an opportunity to make fun of M&C’s, imagining it as The Facts of Life meets The Golden Girls around a towering table of cheesecakes and bonbons. It’s not far from the truth. Anyway, when you have M&C’s every weeknight for 4 years, two things happen: 1) You develop a fevered addiction to having dessert every single evening between 9pm & 10pm and 2) You wind up picking favorites. There were college-wide top choices like vanilla and chocolate cupcakes or magic cookie bars. No one was ever disappointed for jumbo peanut butter cookies or brownies. Less popular nights were baked goods containing some kind of dried fruit and yet, still worse, were the nights we’d be greeted with a few boxes of graham crackers and a tub of peanut butter. It’s ok to not feel sorry for us. Baby Houseman & Princess Bars: destined for the corner, no more! 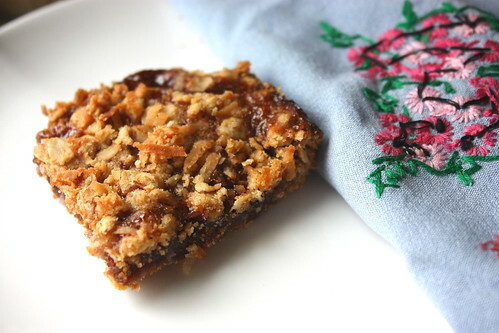 I seemed to be in a camp of one though when it came to my hands-down favorite dessert of M&C’s: Princess Bars! 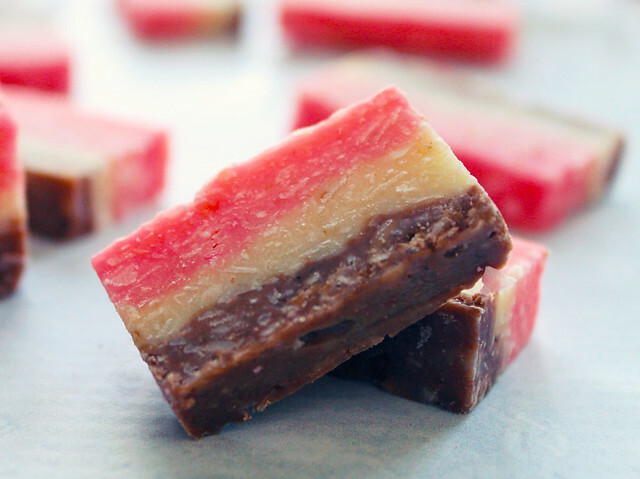 Call it the obvious choice, or part of my femme root, but Princess Bars were perfection – oatmeal, coconut shortbread bars with a layer of sweet and tangy raspberry jam between the toasty, crumbly layers. Nomtastic! And yet, they were overlooked and under-appreciated amidst the hope and possibility of homemade swiss rolls. Unjust! 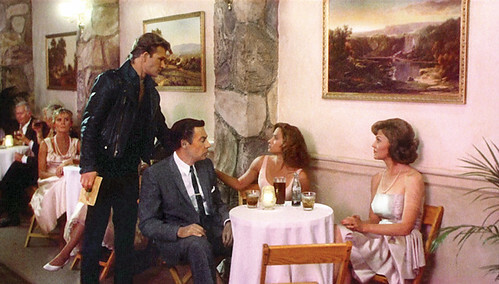 So now, just like when Johnny came to rescue Baby (a to-be Mount Holyoke student, btw) in Dirty Dancing, I seek to revive the Princess Bar. No more will the masses put this baby in the corner. Preheat oven to 350°. Grease a square, 8-inch pan and set aside. Combine all ingredients together except for the jam and reserve 2 Tablespoons of the coconut. Press 2 cups of the oatmeal shortbread mixture into the bottom of the greased pain. Spread the jam over the shortbread base stopping approximately 1/4-inch from the edge. Add the remaining 2 Tablespoons of coconut to the remaining oatmeal shortbread mixture and combine. Sprinkle these remaining crumbs over the top off jam layer. Some spots of jam should be visible between the crumbs. Bake for 35 minutes or until the jam is slowly bubbling and the crust is golden brown and fragrant with the smell of toasted butter and coconut. Allow to cool in pan for 10 minutes before cutting into bars and transferring to wire rack to cool and finish setting up. Note: This is not the official Princess Bar recipe of Mount Holyoke College, as I was unable to find it anywhere. This is my attempt at its re-creation.